You, as an employer, have a responsibility to maintain, in safe working order, all electrical equipment used in your business. If you haven’t already done so, it is essential that you protect your employees and yourself by implementing an Electrical Appliance Inspection & Testing System. Cleaning Equipment Services Ltd provide advice and a comprehensive, fully managed Inspection & Testing service which includes periodic inspection, test and repair of appliances along with full supporting documentation, to help you meet your legal obligations. As we can incorporate repairs with PAT Testing, we will not fail equipment leaving you short, but will repair the equipment on site. 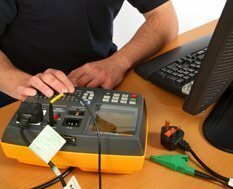 All equipment tested will be labeled and test results will be recorded onto PAT Test certificates. You will be notified in advance when your items are next due for renewal.